Take advantage of our bulk buy deals and stock up your freezer. Our low fat, high protein burger selection includes; Kangaroo, Ostrich and Venison (only 95p each). Healthy, lean and tasty (only 72p each). Delicious, healthy, low in fat and high in protein (only £1.07 each). Full of flavour, rich in vitamins and iron, made from 90% venison steak. 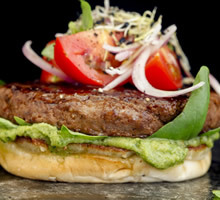 Our tasty choice, nutty and sweet, 75 Wild Boar and Apple burgers for £73.00 (only 98p each).